In case, this time, you want to ditch the apron and just spend time with your loved ones huddling over a table full of delightful dishes, head to one of these restaurants near you for dinner and/or brunch. Mouth-watering roasted chicken and turkey, plum cakes and delicious cookies are some of the dishes that people far from and close to home dig in during Christmas and New Year celebrations. ‘Tis the season to be jolly but what is Christmas without a happy family get-together over a lavish spread of delicious dishes. Mouth-watering roasted chicken and turkey, plum cakes and delicious cookies are some of the dishes that people far from and close to home dig in during Christmas and New Year celebrations. But in case, this time, you want to ditch the apron and just spend time with your loved ones huddling over a table full of delightful dishes, head to one of these restaurants near you for dinner and/or brunch. Kopper Kadai is just the place you need to visit this Christmas if you want soulful music and great ambiance to go along with the food that is being served. Spread laughter, love and Christmas cheer at Café Tesu while digging into their specially curated menu comprises of Quinoa Spring Salad, Goat Cheese & Slow Poached Pear Salad and a wide range of assorted dim-sums and sushi. Feeling like savouring some Chinese this Christmas? Head to Royal China and select from their lavish spread of special cocktails to apple/banana in toffee syrup, deep fried crispy buns with cream custard filling and over 20 dishes including dim sums, seafood, selection of vegetarian and non-vegetarian hot dishes and desserts. Head to Warehouse Cafe for a fun themed-Christmas party. In addition to the red decor at the ‘Red Christmas’ theme party, the special menu promises to be the cherry on the top. Kaitlyn’s Beer Garden is the place to be if all you want is some quiet family time with your special ones over some delicious dishes like Shrimp tossed in sriracha mayo and served on lettuce cups, Chicken pan fried gyoza, Crunchy lamb taco cups, Pad Thai noodles, Desi shepherd pie, Fish and chips with tartar sauce and Chicken tikka masala with mini lachha, among others. Salt Water Café promises to make your Christmas a memorable one with the delectable dishes like Lamb Braised in Mulled Wine, Fried Chicken and Roast Sweet Potatoes, Honey Glazed Pork Belly, Hasselback Potatoes, Homemade Ginger Wine Sauce and Hazelnut Crusted Tenderloin, Yorkshire Pudding, Baked Butternut Squash that they have on offer. BKC Dive‘s special Christmas buffet includes delicious festive treats comprising of a palatable mix of Maharashtrian, Coastal (Koli) and Portuguese cuisine and unlimited sangria/wine/mocktails followed by a thumping DJ night. Head to JW Marriott in Bengaluru to dig into dishes like juicy Roast Turkey with allspice gravy, chestnut soup with bacon crumbles and potato parsnip with porcini gratin at the Christmas Eve Dinner. 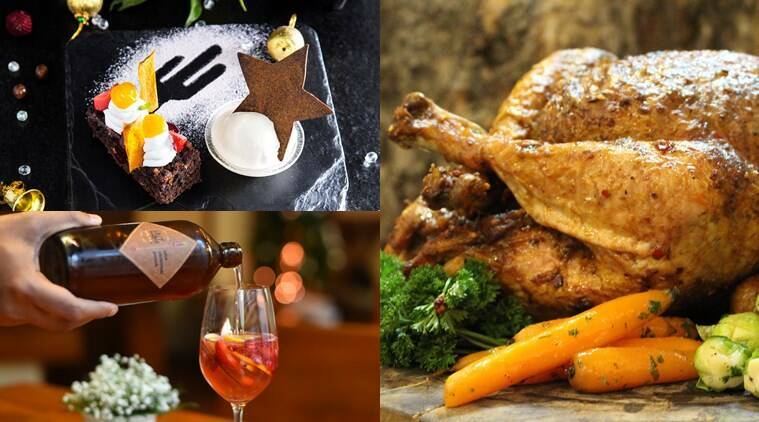 And if its a brunch that you are planning to celebrate the festival with, then the dishes there include traditional Bourbon glazed ribs, rolled stuffed loin of pork in rubies gravy and many more ‘Christmassy’ delights. Go Mexican this Christmas by ringing in the celebrations at Sanchez Restaurante and Cantina. From Mexican Chile Rubbed Roast Chicken, the traditional pork Pozole to anilla ice with cinnamon dusted chocolate star — you name it, then have it. Want to celebrate Christmas in style? Head to The Hilton in Chennai to indulge in a delicious spread at Christmas’ eve dinner and Christmas brunch.